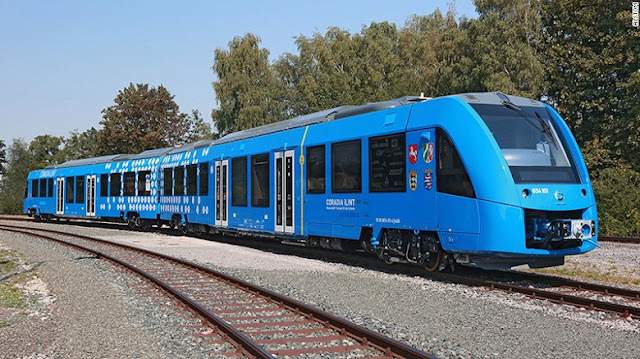 Although the first train in operation will only run a short, 60-mile (96-kilometer) route, four German states have signed an agreement with Alstom, the French company that builds the trains, for the purchase of up to 60 additional locomotives, if they are judged a success. "Alstom is proud to launch a breakthrough innovation in the field of clean transportation," Alstom chairman and CEO, Henri Poupart-Lafarge, said in a statement. "It shows our ability to work in close collaboration with our customers and develop a train in only two years." The new, silent train, called the Coradia iLint, was unveiled by Alstom at a railway industry trade fair in Berlin. It only emits steam and condensed water and is designed to provide a clean alternative to the large number of heavily polluting diesel trains that run on non-electric lines throughout Europe. Germany alone has more than 4,000 diesel-powered train cars, according to Alstom, and about 20% of all of Europe's current rail traffic is hauled by diesel locomotives according to the European Union. The train uses the same equipment as a diesel train but runs on an entirely new technology that uses hydrogen -- a waste product of the chemical industry -- as the fuel source. Energy to power the train is generated by large fuel cells that sits on top of the train. This cell combines hydrogen with oxygen to produce electricity, which is then stored in batteries. Each two-car train-set requires a fuel cell and a 207 pound (94kg) tank of hydrogen to supply it, while the oxygen is obtained from the local air. The train can complete a 500 mile (800 kilometer) journey on a full tank of hydrogen, which is enough for one day according to Alstom. It carries up to 300 passengers. Although the maximum speed of 87 miles per hour (140 kilometers per hour) the train reaches is far below that of other European trains, it is well suited to the quieter and shorter stretches of the European rail network that haven't yet been converted to electricity.